Not one baby, but two…perhaps three…maybe even four? How’d you get so lucky? Well, double doses of joy and anxiety aside, it can become very cumbersome to take care of each baby’s needs. This issue is also faced by mothers who already have a young child, and have a new baby shortly thereafter. To smooth out the rough edges of life with multiples, it is important to take advantage of all of the resources–family, friends, and items–that are available to you. Nursing pillows easily fit into that “helpful resources” category, and as you read on, you’ll learn exactly why. How Exactly Will a Nursing Pillow Help? Though their primary function is to provide a comfortable space for your baby to rest against you, nursing pillows have a variety of uses that extend far beyond this basic concept. Many women use a nursing pillow to make it easier for them to fall asleep. After all, it is common for women to experience stomach, hip and back pain after giving birth, and placing a nursing pillow between your knees or on your stomach can help relieve some of these symptoms. 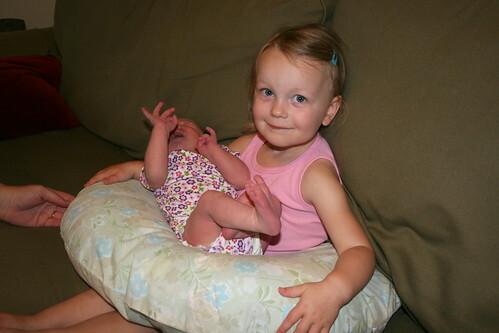 A nursing pillow will also provide support when each of your babies begins to sit up on their own. Placing a pillow behind each of their backs will help ensure that they do not fall over, and this will encourage them to continue sitting up. Additionally, a well-made pillow can be used to help your older children bond with the newborn by letting them interact in a controlled environment. What Other Factors Should a New Mother Consider? The emotional and physical well-being of the mother and each child is an essential aspect of proper development. By using a nursing pillow, the mother and each of her babies will be able to have close contact without the discomfort that can be associated with the breastfeeding process. Additionally, if you are the mother of twins, you can easily co-nurse by using a small nursing pillow on each side of your body. The emotional and physical stress that these pillows help reduce will provide a healthier environment for each child, and this will enable them to relax enough to develop a higher level of important neuron connections. To get the most out of your nursing pillows, you need to make sure that you use them on a regular basis. If transporting them throughout the house becomes difficult, you might want to consider having a set of nursing pillows in each room. Another option is to put your older children in charge of bringing the pillows to you as needed. This will enable older kids to feel more connected to the process, and that can help them develop a stronger relationship with their new siblings. Some nursing pillows, such as the Mombo nursing pillow, come with a variety of pillow case options, which can add a fun, decorative component to your multi-pillowed nursery or play area. Regardless of whether you have one baby or eight (! ), it is always best to take proactive steps toward minimizing the inevitable stress of managing babies. Using available resources and taking a creative approach to using those resources can give mothers the additional support they need to feel more prepared and less stressed on a moment by moment basis. Akilah Richards is a mother of two daughters who are less than two years apart. She speaks from personal experience about the benefits of a good support system and the best nursing pillow she could find. Easy solutions ike the Mombo nursing pillow can help to significantly lessen the stress of the beautiful chaos of motherhood.